Two options viewed on the return allowing passage of the Gendarmes crux. After getting rejected from entering Canada for stupid reasons at the Sumas border crossing, Josh and I made our back up plan for Ragged Ridge. We drove over to the Easy Pass TH and hiked the nice 3.6 mile trail to the pass at about 6,550 feet. Thank you to the WTA workers improving the trail the last 600 feet to the pass. Here is where the fun begins. We left the trail at the pass right before it begins descending down towards Fisher Creek and began a sidehill traverse on the south side of the ridge. We generally made a slight ascending traverse crossing many small gullies and buttresses until reaching a large basin just below the Mesahchie Col nearly a mile from the pass. This traverse mostly follows the 6600-6700 foot contour. After pulling out the map we realized this wasn't the correct basin to camp. We looked further west and noticed a smaller basin in the 6,700 foot range with a small rocky knob just above which corresponded to the map. We also noticed Mesahchie Peak still well off to the west. Unfortunately this basin was still over an hour of traversing away! We continued and stayed on a good grassy line around 6,800 feet until we reached the large gully just before reaching the basin. Here a waterfall greeted us and we had to descend 200 feet of steep scree to reach an easy place to traverse across. Past the creek and waterfall, a couple more small ribs was passed and we reached camp at 6,600 feet in the basin just south of Mesahchie Peak. Snow mostly filled this basin so we made camp on the flattest place we could find. The hike to this point from the TH took us about 5 hours. Since we had a late start of 11am from the TH, we relaxed the remainder of the afternoon under the hot sun until it fell behind the small knob above the basin. The next morning we left camp just after 6:30am and began ascending for 800 feet to a large flat bench at 7,400 feet with great views of Mesahchie and Katsuk. The final 250 feet of this ascent will certainly involve some class 4 either up one of the various ribs or gullies. We tried 3 different ways and every one has some tougher scrambling. We began traversing west at the 7,400 foot level as our goal for the day was Kimtah and Cosho. the traversing started easy and apart from the major gully near the Grotesque Gendarmes, was straightforward. 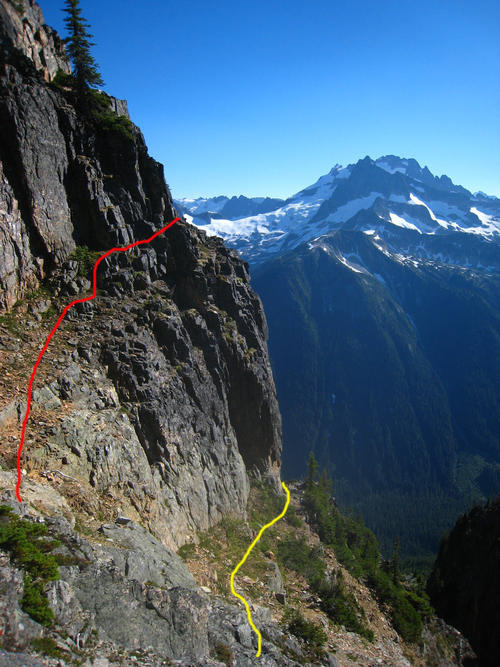 Contrary to popular belief, the traverse on the south side of the Ragged Ridge is quite friendly compared to other North Cascades traverses and we never had any problems traversing the numerous gullies and ribs along the south slopes of Katsuk and Kimtah. It was important though that we stayed at the 7,400 foot area because some gullies cannot be traversed lower than that. After 2.5 hours of traversing we reached a prominent buttress and a huge cliff right after crossing a very wide talus filled gully. Above us near the saddle between Kimtah and Katsuk we saw the Grotesque Gendarmes. A report from 8 years ago here on CC by Tom S mentioned descending this prominent buttress and locating one of a couple ledges to reach easy terrain once again. We descended about 150 feet down the buttress, located a narrow gully which we descended another 50 feet and rounded a corner. We then saw a nice ledge leading to the talus below the cliff but a very airy step midway across left us uneasy. So we continued another 50 feet down the gully and located another ledge that was easier. We feel we descended a total of 250-300 feet. We felt this was also the crux of the day and certainly 4th class (with exposure) no matter which way you went. Once beyond this difficulty, it was smooth sailing as we continued on an ascending traverse back to 7,400 feet and crossed a few more gullies. I believe it was the third major gully past the gendarmes that we used to climb straight up to the ridge just west of the summit of Kimtah. It was an obvious gully and the first one we saw with running water past the gendarmes. The 3rd class scrambling was on solid granite up this gully that reminded me of a natures staircase as the rock fractured into perfect cubes. Once we reached the ridge between the summit and the sub-peak to the west, we continued a few more minutes to the east to reach the highest point which entailed some more class 3 scrambling. We reached the top just before noon after 5.5 hours on the move. We found a mountaineers register at the summit that was placed fairly recently and signed it. Now we started towards Cosho by heading west and traversing just south of the main sub-summit following the first cairns we saw all day. The route stays close to the ridge crest the whole way following ledges and gullies just to the south side of the crest. We reached the col between "Thieves Peak" and Kimtah quickly and jumped onto the "glacier" and traversed to the north of "Thieves Peak". We saw no reason to rope up as we stayed close to the edge of the snowfield and saw no cracks. Thanks Tom for that info. We ascended the snow until reaching the upper east face of Cosho and scrambled class 3-4 terrain the final 250 feet to the summit, reaching it around 1:30pm. The views were spectacular. There was no summit register however...only an empty aluminum can that we couldn't open. We reversed the route to the Cosho/Kimtah col and instead of re-climbing Kimtah, we traversed lower on the south side of Kimtah following some cairns but the ledge system we followed was perfect taking us right back to the gully we used to ascend Kimtah. From here we reversed the route back and returned to camp at sunset. The following morning we left camp at 7:45 and re-ascended the 4th class ribs to the 7,400 foot bench. I made sure to study the route the night before and noticed a gully the appeared to head straight up to the mushroom looking summit block of Katsuk. There was a decent amount of snow in it but it looked like we could avoid it by climbing the rib to the left of the gully. So we made a short ascending traverse to the small waterfall where the gully I wanted to climb began. We climbed to the left side of the water to avoid the waterfall and continued scrambling up a blocky mix of granite and slate (the granite was better!) to either side of the flowing water. At about 8,100 feet the gully forked with the left gully taking us right to the summit block. We avoided the steeper snowfield with a scary runout by climbing the class 3-4 rib just to its left separating it from another, scary looking gully just to the south and west. The final 200 feet to the summit block we followed the small moat on the left side of the snowfield as the rib narrowed and became more difficult. Once at the 50 foot summit block we climbed up its west side (class 4). We reached the top just before 10am about 2 hours from camp. There was a recent summit register in a plastic pill container placed in 2004 here. After 30 minutes on top, we retraced the route scrambling back down the rib and the gully returning to camp. We left camp at 1pm and decided to try a lower traverse back. The first half of the traverse back to Easy Pass we did the same route. Once we reached the large basin below Mesahchie Col, we aimed to traverse below the series of rocky ribs and reach the trail about 150 feet below the pass to try and shorten the traversing. Although the route went very well without any issues, we didn't reduce the traversing much as we only hiked for 10 minutes up the trail to reach the pass. A nice, quick hike down the trail got us back to the car just before 5pm. All in all, 3 north cascades bulgers is a success. Really the only reason we didn't do Mesahche is because I had no clue what the route was as I didn't look it up and the only beta we had with us (Tom's TR) didn't mention Mesahchie. I'll have to go back to day hike it later this year to finish Ragged Ridge.